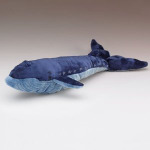 Sea Stuffed Animals: Stuffed Penguins, Sharks & More! Come dive into an adventure under the sea with an array of our fun ocean creatures. Our selection of crabs promise not to pinch, and even our fiercest looking shark stuffed animals are soft and cuddly. Our realistic stuffed penguin toys are beautiful and plush, while our silly ones have a zany koosh head that’s fun for any age. There’s a range of stuffed animal fish for freshwater fishing enthusiasts such as bass, crappie, catfish and trout. 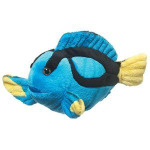 For more exotic fish fans, we have marlins, sailfish, tuna, sunfish, blue tang, puffer and more, all a lovely combination of realism and comforting plush. From small children to strapping fisherman, fish lovers of any age would appreciate the beauty and comfort of these sea and ocean stuffed animals.